Looking for someplace to eat in Malibu? This city is known for having some great dining spots on the water and sure enough, this is one that isn’t hard to miss. The one place you can’t miss out on when you’re in Malibu is the world-class restaurant and favorite amongst the locals, Duke’s Malibu. If it’s not enough to enjoy your meal right on the sand, overlooking the Pacific Ocean, Duke’s also serves some of, if not the best food in town. Guests can enjoy the delicious flavors of Hawaii created with unique and traditional Hawaiian recipes. Whether you are coming in to sit by the bar and grab a few cocktails, or you’re dining with a large group near a window that overlooks the water, you’ll feel like you’re right in Hawaii from the traditional décor to the tropical food. From the moment you walk into Duke’s, the smell of good food cooking will guide you into the tribal influenced entrance. You’ll then be greeted by a friendly hostess who will lead you to your table. Looking over the menu can be overwhelming, however, with a little help from your server, you should have no trouble picking out the meal that will satisfy your taste buds. Some of the most popular menu items include the Tahitian Shrimp appetizer and Panko Crusted Calamari. For the main course, you can’t come to Duke’s and not try a traditional Hawaiian dish, such as the Seven Spice Ahi or the Grilled Island Style. Whichever you decide to order, you won’t be disappointed in the exquisite service, delicious food and even better atmosphere. 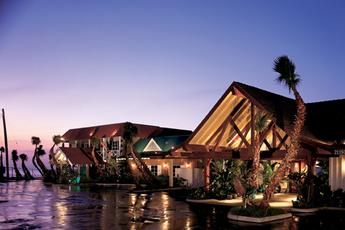 Duke’s originated in Hawaii before making its way to California, making it one of Malibu’s most popular dining spots. Check out more of Duke’s at their website, or calling (310) 317-0777.